Illuminated Tires: A Brilliant Idea Whose Time Has Finally Come? 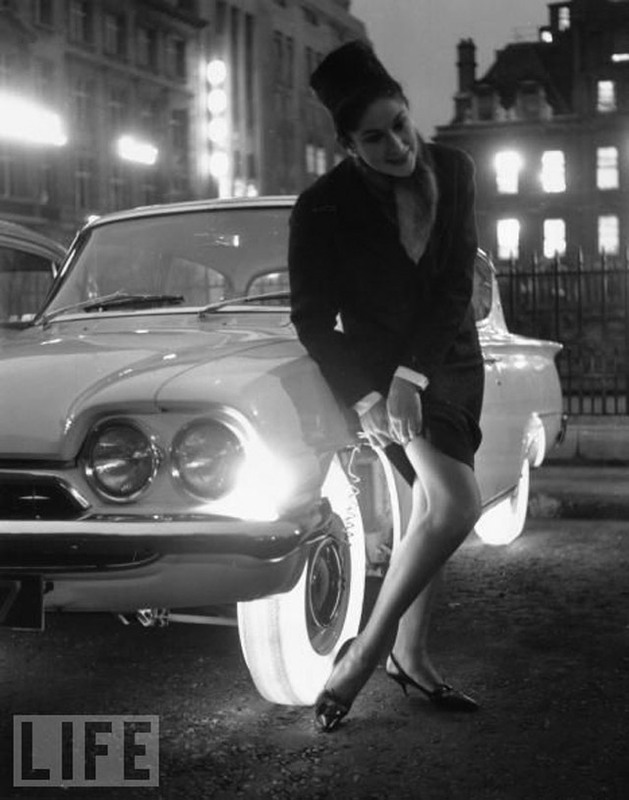 In 1961, Goodyear (the UK branch, I assume, from the Ford Capri in the picture) unveiled their latest brilliant idea: tires that glow from the inside out, thanks to bulbs mounted in the rims and being made of a special formula of semi-translucent synthetic rubber. I wonder how long those bulbs lasted after a bit of spirited driving and pot holes. As this woman demonstrates here, there were all sorts of benefits, such as adjusting one’s garter at night. And the tires were to be available in a variety of colors too. Maybe 1961 was a bit early for this, but I can really see this being a hot thing among a certain genre of modern-day car customizers. Where does the aftermarket tire business go, since it’s a bit hard to mount wheels bigger than 30″. But to have them glow and pulsate, and lit by rugged LEDs; now that’s an idea whose time has finally come. On one hand, as you stated, these tires would be another step in the customizing of cars with LEDs and other lights, but on the other hand, I see a potential motorcycle safety feature. It may look like something from Tron, which old-school bikers will probably hate, but glowing tires floating along the street definitely will make a motorcycle visible to drivers at night. I recently saw a bicycle with glowing blue discs on either side of each rim (presumably some kind of LED setup). Aside from making the bike look like a prop from Tron in a way that would probably delight a generation of 10-year-olds, I must say that the glow did make the bike vastly easier to see from a moving car. The blue glow acted like marker lights that made it much simpler to judge at a glance the bike’s velocity and exactly how much space it was occupying on the road, which isn’t necessarily the case with the little helmet-mounted or seat-frame-mounted red lights a lot of cyclists use at night. I have a question that has intrigued me for some time. How do you send power to something that spins, like gun turrets or radar dishes – or the light bulbs in the rims here – without wires to get tangled up? I’ve googled this but haven’t found anything that answered my question. And flickering tron tires would definitely get the attention of people otherwise absorbed with their in-SUV entertainment/distraction devices. I refuse to ride a motorcycle now. Things that turn slowly or seldom (like a turret or even a steering wheel) can use a brass or copper contact ring that has some spring-pressured contacts that maintain a connection as the parts turn. But trying to do that on an automotive wheel that goes both really fast and really long distance, well those would wear out awfully quickly. With LEDs, is there a way to power them externally so that the charge travels through the tire/wheel? Good questions, these. > Things that turn slowly or seldom (like a turret or even a steering wheel) can use a brass or copper contact ring that has some spring-pressured contacts that maintain a connection as the parts turn. That’s how the horn in my cars works. However, today the electrical connections to the steering wheel are done through a flexible circuit board / ribbon cable. This is known as a “clock spring” because of its similarity to the spring in a real clock. However, that only works when the object can only make a fixed number of rotations (such as a steering wheel), so not suitable for these tires. They would have batteries inside of the light. All the new cars with tire pressure sensors have batteries in them also. Contacts & brushes. Ever taken a generator apart? I guess they didn’t figure it out. There appears to be an external ring on the wheel which could be the rotating contact surface. Hub dynamo. No big deal. Bingo. Fixed magnets with windings on the wheel. Works when dirty, never wears out. I see an electrical cord from the lady to the wheel. She is electrifying! Radar dishes send out microwaves which are not generated in the dish, but are sent to the dish through microwave channels. They could be powered by induction, the way passive RFID sensors are powered. During the day or when the vehicle is off, they could store charge in a small battery or super-capacitor. The vehicle could command the in-tire modules to turn on, change colour, etc. using the same signal that’s being used to charge them. wouldnt that affect wheel balance? yes – also, like how do tyre pressure sensors work? Reminds me of the ENVY I had when one of the neighborhood kids got blue tires for his bike (which was very trendy in the 1970s). 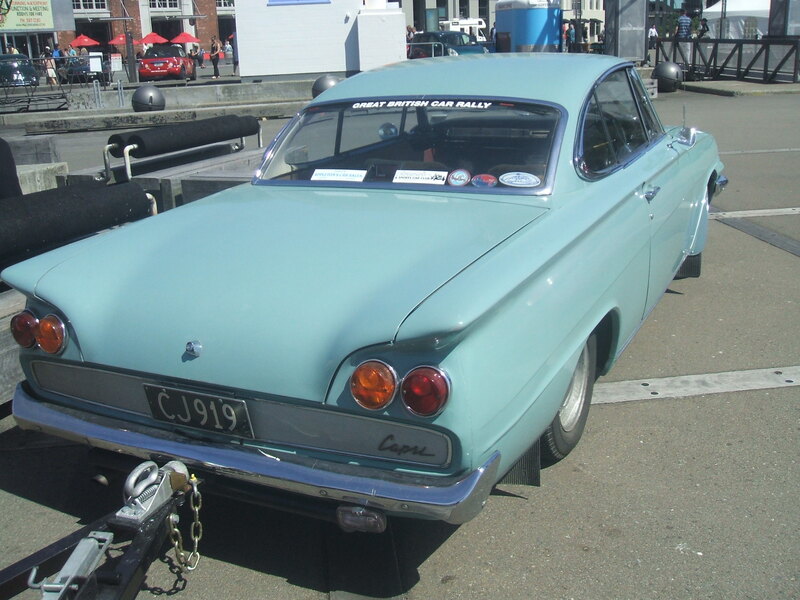 I pestered Mom and Dad for months, but was stuck with plain black forever more. In college, I joked with a friend that I wanted colored tires for my V6 Vega so I could leave blue (or red) burnout stripes down the parking lot. I’d rather not see illuminated tires since I’m sure they will be poorly executed. On the other hand reflective sidewalls like they use on bicycle tires could bring about the resurrection of whitewall tires. Ha! I saw this silly photo years ago. If they do make them I bet they’ll be a hit with the hip-hop rapper crowd! quiet! if some politician catches wind of this, they will get together with the tire industry and get it mandated for “safety” and tire prices will double. I can only imagine the distraction a freeway full of glowing tires would create. Just what I was going to post Matt but you beat me to it. And after it is 6 years old, it will begin flashing to alert the world it is too old to be safe and must be replaced. Or preemptively outlaw it as a distraction to other drivers, which I think is probably the more likely response. I seem to remember some wheel hubs that could display pictures or even simple “movements” that were LED based and sensed the wheel rotation via a hall effect sensor so that the picture itself did not rotate while the car was in motion or changing speed. Also a few years back there were variously colored tires that would leave blue, red or yellow streaks or smoke when burning rubber. How did those do? Would LED lit tires do any better? Also I realize I should be looking at her legs, but do I see a wire running from the wheel to the fender next to her leg? If you turn it on and off rapidly enough, a light thinks it just on. DC motor speed controllers work that way just like Ed said. The technology to do it isn’t the problem. The logic is the problem. Paul, if an idea’s time has come does it have to be a good idea. I think this could go back in the oven and bake a few more decades. I agree with the above comments about the distractions. Somehow I’m reminded of the glowing 64 Malibu sedan from Repo Man. I have an old Popular Mechanics from the 60’s that had a similar pic, though most likely from the US since the cars in the pics were a Lark, Thunderbird and a VW. Though I recall it being a Firestone idea at the time, I don’t doubt that they probably were both working on something similar at the time. First thing I thought was “Repo Man”…. *Lone voice in the crowd* I like them! This reminds me of the under-carriage neon strips that were all the rage a decade or so ago, but you rarely see anymore. I suspect that lighted tires would be the same sort of flash in the pan and only appeal to those desiring to pimp their ride. The BBC doesn’t let people outside the UK to watch i player net-casts, unfortunately. the 335 is gorgeous ..a sweet little work of art ..some of them had the 107E engine, right? sure they’re just not radioactive?